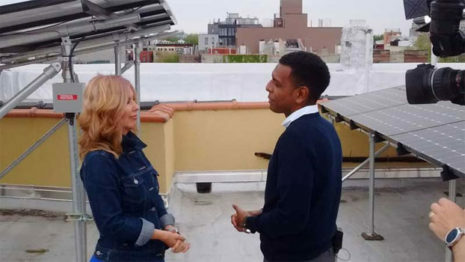 Watch Solar One’s Juan Parra explain how community solar makes renewable energy accessible to every New Yorker on the Spanish language television network Univision. In the clip, you can see Juan and correspndent Berenice Gartner on the roof of an HDFC co-op building in Crown Heights. The solar installation, including the cool canopy for the panels, was installed by Brooklyn Solar Works. You can also catch a glimpse of Daroga Power‘s community solar installation, which you can sign up for on the Here Comes Solar website here. Ansd while the segment is in Spanish, even non-Spanish speakers will be able to follow along. Congratulations to Here Comes Solar, Brooklyn Solar Works and Daroga Power on the great press for their great work!